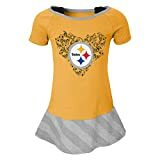 Your little fan can show team loyalty with this NFL Infant drop waist dress from Outerstuff. A great gift idea, this features foil screen printed team graphics on the front, easy dressing and changing, and is made of machine washable 100% cotton. Officially licensed by the NFL. The Manchester City Curtains are an official product and are produced under licence for Manchester City Football Club. The pack contains one pair of ready made curtains, each curtain features the club crest some are in white and some navy on a sky blue background ( the tie backs in the image are not included in the pack ) . The Curtains are made from 52% polyester and 48% Cotton and measure 66 in width (168cm) and 72 in length (182cm). These Manchester City Curtains would be ideal for the bedroom of any Manchester City Fan. 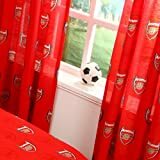 To achieve the perfect bedroom for any Man City fan we also stock, Duvet sets in two designs and a rug and an alarm clock, we also have many more soccer souvenirs available to show your support for Manchester City. To see our full range of Manchester City Souvenirs simply click on the link from the left-hand menu. Here you will find a large selection of Manchester City products for the home or the match.